Available in 9 colour tones, the First Edition alcohol markers contain 6 pens in a variety of tonal shades, perfect for shading and adding colour graduation to your projects! 1. Stamp the SANTORO®'s Willow Aurora image onto a piece of white cardstock. 2. Once the ink has dried, colour the dress, flowers and hair using the First Edition Sangria marker (18), add some detail using the First Edition burgundy marker (17) to create shading on the hair, dress and flowers. Use the twin blending markers to blend the colours. 3. Colour the skin using First Edition porcelain marker (07) and add some detail with ivory marker pen (08). Use the other side of the pen to blend the colours together. With the First Edition posy marker (10), colour and blend the cheeks and lips. 4. Create an outline for the image using light grey marker pen (01). 5. Cut out the stamped image to 8.2cm x 8.9cm. Add to an 8.5cm x 9.2cm piece of the SANTORO®'s Willow red patterned paper. 6. Cut a piece of the SANTORO®'s Willow pink distressed paper to 14.9cm x 14.7cm and stick to the centre of the pearlescent card blank with double sided tape. 7. With the SANTORO®'s Willow green patterned paper, cut a 13.4cm square and add to the centre of the card. Cut a piece of 11.8cm square from the SANTORO®'s red and white floral paper and layer on top of the green paper at an angle. Finally, cut a piece of heart paper to 13.3cm x 9.9cm and add to the middle of the layered cards. 8. To decorate the card, stick a SANTORO®'s Willow large black floral flower to the top right of the card and layer a red and white floral blossom on top. Tuck a paper leaf under the paper blossoms on the left side and stick to the card. 9. Add the stamped image to the centre of the card using foam pads to make the Aurora character stand out as a centrepiece. 10. 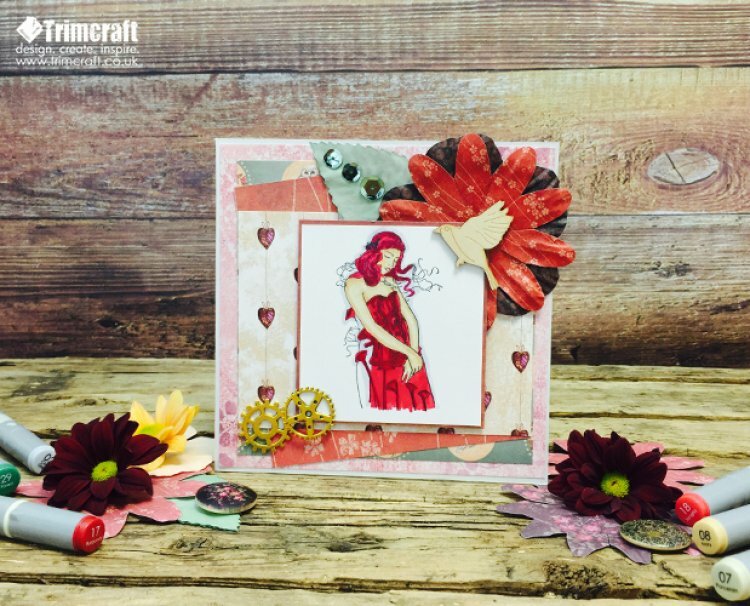 Add a wooden bird to the top right corner of the card and glue a gold metal cog to the bottom left of the stamped image. To finish, glue another metal cog onto the card beside the stamped image and add three sequins to spine of the paper leaf. What do you think to our new Pens? The First Edition Marker Pens are now available to buy & we are looking forward to seeing your colourful creations in the project gallery soon!